Interestingly enough, California has been affected by many droughts in past years, with the worst period of recorded drought (since the inception of hydrology) occurring between 1928-34, 1976-77, 1987-92 and 2007-09. California's water tables depend on a few Pacific coastal storms occurring between November and March each year. If a Pacific high pressure system lingers off the coast preventing those storms from depositing rain or snow in winter months, dry conditions in California and Silicon Valley, may last throughout the year, or a few years, if high pressure systems recur in consecutive years. 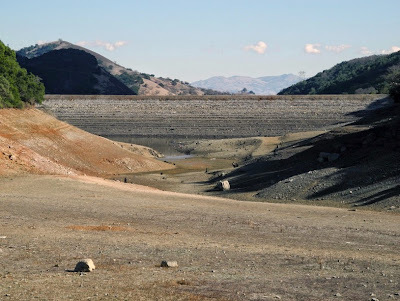 Likewise, according to E. R. Cook at Earth Science Reviews (as illustrated by the Mercury news), the Western United States has experienced prior 200-year droughts during the European Middle Ages, so some feel our shorter periods of drought are of less concern in terms of climate change. Of course, that hypothesis is controversial, since access to water remains a political and economic source of dispute for many Californians engaged in agriculture or near large urban cities, where the bulk of city water may be imported from other counties yet used more for landscaping than for food production. Sadly, the creation of new California wells in agricultural regions has more than doubled in the last several years, with apparently no State records or monitoring taking place for privately-drilled wells (which now occur at much deeper depths than in past years) and which continue to deplete state aquifers, according to a July 2015 Water in the West Stanford University report. These privately-held wells reportedly are allowed to drain their California aquifer source dry, unlike wells in other states where extracted water is monitored so aquifers are not significantly depleted, according to an August 2014 National Geographic report on the boom in groundwater drilling in California's Central Valley. New Legislation to protect aquifers: Too little too late? New California legislation on groundwater pumping may be too little too late to save heavily-tapped aquifers, since many changes in new California laws will not take place until 2020, based on resistance from California agricultural lobbyists who have fought to allow Central Valley farmers access to new wells without extraction limits. Under the new laws drillers have 5 to 7 years to develop extraction plans, yet have until 2040 to implement them, time which may be used to repeal these new laws by agricultural lobbyists, as composition of the State legislature changes over time. According to a Cal Alumni Association article, "The predominant techniques used to measure well water levels—measuring tapes or pressure sensors—are labor-intensive and costly. The U.S. Geological Survey monitors less than 10 percent of its 20,000 wells, California’s Department of Water Resources monitors a few hundred." The article continues to state that the development of new sonar devices which not only locate aquifers but monitor their depth, may aid local legislation efforts to monitor water extraction, so new agricultural wells are no longer draining water resources and aquifers completely dry in some regions of California. 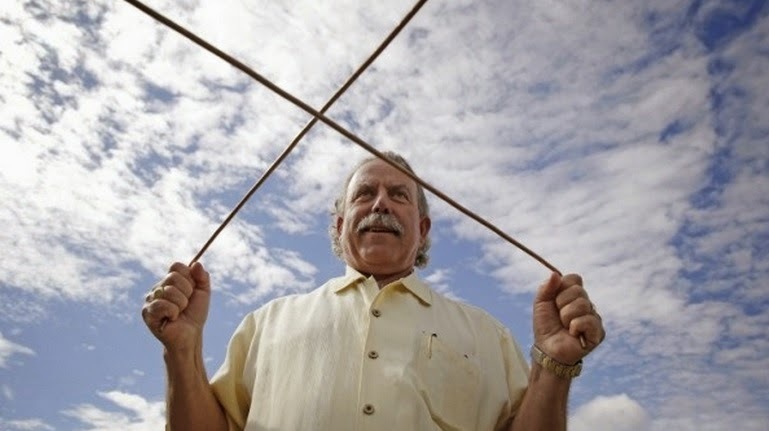 "Water witches," or dowsers, those who use so-called divining rods (parallel hand-held metal rods) to locate underground sources of water, have been in high demand since the current drought has lingered and water restrictions have increased. Many practitioners are members of the American Society of Dowsers which has a San Jose chapter with both "spiritual" healing and water dowsers. The ASD also has a Water for Humanity Fund which seeks to use practical dowsing to improve global water sourcing and global water purification projects, among other goals. Their water dowsers have been particularly popular in the Wine Country. "Pretty much all the farmers I know won't drill a well if they don't have a dowser," said Napa Valley vintner Marc Mondavi, of the famous wine-making family, who happens to be a dowser. Two years ago, Mondavi released a new label - a Cabernet Sauvignon and Chardonnay called the Divining Rod - a tribute to his dowsing. Pretty much all of my weekends are spent dowsing. I'm backlogged." Dowsing practitioners like Mondavi claim a 95% success rate in locating water, yet without adequate regulations protecting California's aquifers from continued, non-monitored drilling and extraction, or a per unit reduction in the state's ABAG Regional Housing Needs Assessment (RHNA) mandate to provide low cost housing in proportion to new office development in Silicon Valley cities, California's water from all sources, may be in scarce supply by 2040. Next 10, a San Francisco-based ecological non-profit, hosts an online California Water Challenge Quiz and fact sheet which presents some interesting facts and water use alternatives for residents, along with the ability for residents to submit grass roots ideas on water conservation which might positively impact the availability of California's natural resources in future years. To find a recent book or article on California's water challenges at your local library, check this list of titles on OCLC. To find a book on Dowsing at your local library, check this list of titles on OCLC. To find a book on California drought history and hydrology at your local library, check this list of titles on OCLC. To find a book on California legislation and well drilling technology at your local library, check this list of titles on OCLC. To find current California State Water Code, see the California Water Code list at Leginfo. To find recent or pending state legislation on California wells, safety, drilling and water extraction, see the current bill list at Leginfo.